4 Chicken breast fillets, about 100g (3.5oz) each. 40g (1.4oz) Cake flour, sifted. 225ml (7.6floz) White wine or extra chicken stock. 2 Tablespoons chopped fresh or 2 teaspoons dried tarragon. 100g (3.5oz) Pickling onions, peeled, or spring onions. 100g (3.5oz ) Frozen peas, thawed. Wash chicken and pat dry. Heat the oil in a large frying pan. Add the chicken. Cook over a medium heat for 10 minutes, turning once, until browned and no longer pink in the centre. Transfer to a plate and cover with foil. Add celery, chopped onion and garlic to pan. Fry for 5 minutes, stirring frequently. Remove from heat. Add the flour and stir to form a smooth, glossy paste. Return the pan to heat and gradually incorporate chicken stock, about 25ml (.85floz) at a time, stirring vigorously. Add wine or extra stock, stirring constantly. Turn heat to low, then add chicken. Slice mushrooms, add these and tarragon. Cook for 5 minutes. Stir in onions and peas. Season with salt and pepper and cook for a further 10 minutes. Garnish with fresh tarragon and serve immediately. 1,6kg (13.2 lb) Chicken, giblets removed. 1 Onion, peeled finely grated peel of ½ lemon. 25g (.88 oz) Soft butter. Fresh mixed herbs, to garnish. Preheat oven to 180ºC | 356ºF. Rinse and dry the chicken. Put onion in the cavity. Mix together lemon peel, lemon juice and butter. Stir in the dried herbs, black pepper and garlic. Using your fingertips, gently loosen the chicken skin from the breast. Rub two-thirds of the herb butter mixture under the skin. Rub the remaining butter mixture all over the chicken. Put the chicken onto a rack in a roasting pan. Roast for 1 hour 20 minutes, basting occasionally, until the juices run clear when the thickest part of the chicken is pierced with a skewer or sharp knife. Put on a serving platter, garnish with fresh herbs and serve. Serve the chicken hot with roast potatoes and seasonal vegetables. Alternatively, leave the chicken to cool completely and serve with a green salad. 6 Skinned chicken pieces, about 100g (3.5 oz) each. 175ml ( 5.9 floz) Hot chicken stock. 60ml (2.03 floz)Dry white vermouth. 1 Large onion, peeled and thinly sliced. 2 Rashers rindless streaky bacon. 4 Spring onions, trimmed and finely sliced to garnish. 2 Tablespoons chopped fresh parsley to garnish. Preheat oven to 190ºC | 374ºF. Heat the oil in a large frying pan. Add the chicken pieces. Cook for 10 minutes, or until evenly browned on all sides. Transfer the chicken to an ovenproof casserole dish. Add potato slices to the frying pan. Cook for 5 minutes on each side, or until evenly browned. Put into the casserole dish. Add the chicken stock and vermouth to the dish. Sprinkle over the garlic and onion. Finely chop the bacon rashers and scatter on top. Sprinkle over the dried herbs, chicken spice, salt and pepper. 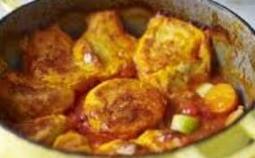 Bake for 30 to 40 minutes, or until the chicken juices run clear when thickest part of chicken is pierced with a skewer and the potatoes are tender. Garnish with sliced spring onions and chopped parsley. 4 Chicken breast fillets, about 100g (3.5 oz) each. 1 Red sweet pepper, seeded and cut into strips. 1 Green sweet pepper, seeded and cut into strips. 1 Small green chilli, seeded and chopped. 225g (7.9 oz) Basmati or long-grain white rice. 300ml (10 fldoz) Chicken stock. 50g (1.8 oz) Stuffed green olives, halved. 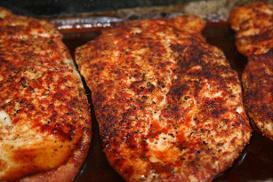 Cut chicken breasts in half and season. Heat oil in a large, deep frying pan over a medium heat. Add half the chicken pieces and brown on all sides. Transfer to a plate and repeat with the remaining chicken. Set aside. Turn up the heat slightly. Add the onion and peppers. Cook for 5 minutes. Add garlic and chilli. Cook for 1 to 2 minutes, until garlic is golden. Stir in rice and sauté for 1 minute. Add stock, tomato purée, paprika and 175ml (5.9floz) water. Bring to boil, then reduce the heat. 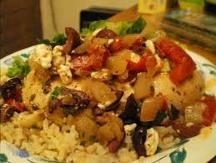 Put the chicken and olives on top of the rice. 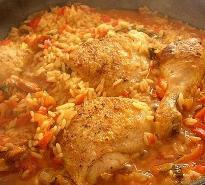 Cover and cook gently for 20 minutes, or until rice is tender and chicken is cooked. Variation: For a more spicy dish, do not remove the seeds from the green chilli before adding it to the pan. In a bowl, mix together tomato purée, lemon juice, vinegar, sugar, paprika, garlic, salt and black pepper. Preheat the grill or prepare a braai fire. Put the chicken onto the grill pan or braai grid and brush with the baste mixture. Grill for 5 minutes, basting occasionally. Turn over chicken and baste other side. Grill or braai for a further 5 minutes on each side, basting regularly. The chicken is cooked when the juices run clear when the thickest part of the chicken is tested with a skewer. You can marinate the chicken in the tomato purée mixture up to 3 hours before cooking. Turn the chicken in the mixture to coat evenly, then cover and keep in the fridge until required. Marinating the chicken allows the flavours to develop and gives a more taste when cooked. Sift together all the coating ingredients and place in a clean cooking plastic bag. Coat each chicken piece first with the beaten egg, then with the flour mixture in the bag. Make sure you coat each piece completely with the flour. Heat the oil in a skillet. Brown the chicken in oil slowly, uncovered. Once browned, cover the skillet and keeping frying on a very gentle heat until the chicken is fully cooked.